This site records the First World War experience of Major F W Smith as a pilot in the British Royal Flying Corps (RFC) and later the Royal Air Force. Major Smith volunteered for service in the RFC early in the war. He was then serving as a Captain in the Royal Field Artillery TF. He was accepted for pilot training by the RFC in January 1915. Having completed his flying training he was sent to France in April 1915 and was assigned to No. 2 Squadron equipped with BE2's. He later served with No.s 27 and 62 Squadrons deploying with them to France on their first operational tours. This record is compiled from Major Smith's 1915 diary, his pilots log book 1915-1917, his photographs and a No. 62 Squadron history together with additional research. It concentrates on his initial training and his time in France. When he was assigned to Home Establishment he was involved in flight instruction as a Flight Commander and then as a Squadron Commander with No.s 24 and 3 Reserve Air Squadrons. Major Smith accumulated 200 hours flying in France with No.s 2 and 27 Squadrons in 1915 and 1916 on BE2s and Martinsyde Elephants. He returned to France in 1918 in command of No. 62 Squadron equipped with Bristol Fighters. 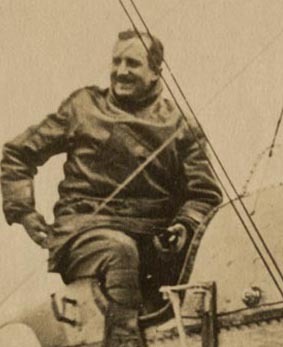 Major Smith survived the war and after the cessation of hostilities, his Squadron moved to Belgium. He was released from service at the end of February 1919 and turned down an offer to go to Australia to join the AFC preferring to return home to civilian life to help run the family engineering business. He was mentioned in FM Haigh's July 1919 despatches for his service in the RAF between September 1918 and March 1919. The site is organised in sections covering Major Smith's postings during the war. A separate page provides a short background on the RFC in France. The editor would welcome contact with anyone interested in the units mentioned and any comments on the photographic record. Extracts from the RFC and RAF communiqués are from three books published by Christopher Cole (2) and Chaz Bowyer (1) covering 1915-18. For other references click here . St Omer Appeal to commemorate the British and Commonwealth airmen who served in France during the First World War.